1 x COPAG Gold - Black Texas Hold'em Plastic Playing Cards. 1 x COPAG Gold - Red Texas Hold'em Plastic Playing Cards. 1 x Large Metal COPAG Dealer Button in Acrylic Protective Case. Comes in a nice gold coloured presentation box. Dual Card Pack Width: 135mm. Dual Card Pack Height: 125mm. Dual Card Pack Depth: 28mm. This Copag Gold Texas Hold'em Dual Plastic Playing Card Pack & Dealer Button contains 1 each of the red and black playing cards and also a metal dealer button which is in a protective case. 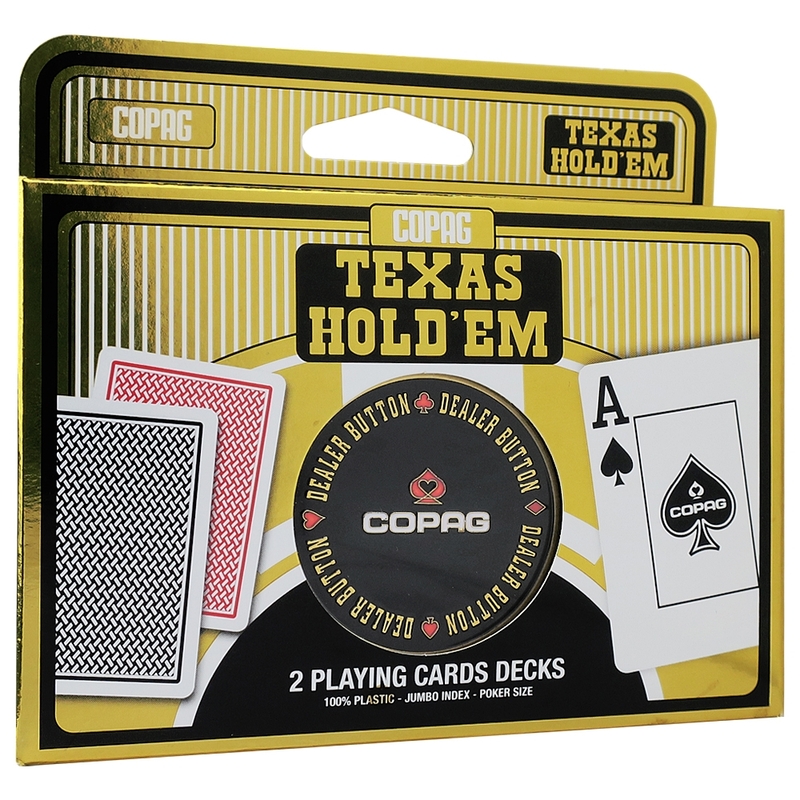 The Copag Gold Texas Hold'em 100% plastic playing cards are poker sized, have a 2 corner Jumbo index for clear card recognition and a symmetrical weave patterned back. The Copag Dealer Button has been specifically designed to help show to whom the dealer is dealing the cards to next so there is no mistaking where you are in the game. Made from solid metal and finished in shiny gold with a colourful infilled design same on both sides. The Dealer Button has a satisfying weight, look and feel which gives off an air or quality and comes in a clear plastic acrylic case to protect your Dealer Button when not in use and perfectly sized to fit in your pocket.